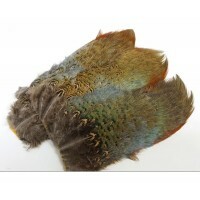 Strung Ringneck rump hackle is great for when you only need a small amount, or you're looking for a specific length in feather. 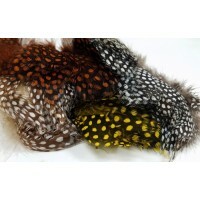 If you only need a short or long feather but don't want a full rump patch this is perfect for you. Available in 16 colors. Select Saddle is the longer of the saddle hackles. 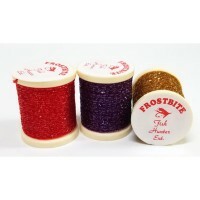 Coming in at 5-7.5 inches it is perfect for your larger streamers, spey flies, and tails. Available in 57 colors. A ?Ringneck Rump Patches is the full patch off the back end of the Ringneck Pheasant. 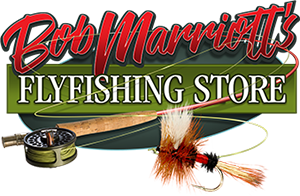 The patch comes with all of of the feather lengths that you need to tie any size of wet fly. 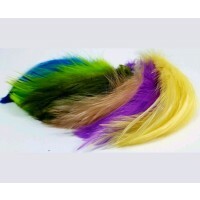 With even more uses for spey flies, streamers, shrimp patterns, and more you have a never ending use for these feathers. Available in 16 colors. 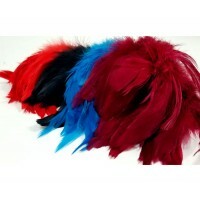 Neck hackle is a stiffer feather compared to saddle hackle. 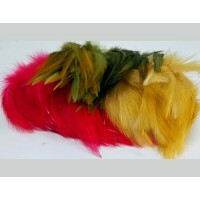 this makes it a great feather for salt water patterns, matuka's, bass flies, and other patterns. With its stiffness it also has longer fibers on the feather allowing for a bigger profile when wrapped for a body or collar. Available in 28 colors. Jumbo Guinea is a select cut of guinea, parting this section out for the spey tyers. 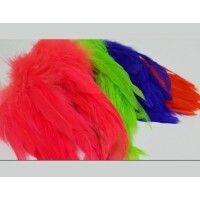 These feathers are longer in length, and have longer fibers to match your big spey flies. They can even go on those big winter steelhead flies. Giving you a longer collar or even a section of body hurled in guinea. 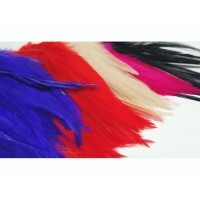 Due to a lesser amount of these feathers we only dye them is 18 colors. 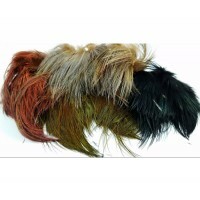 Large Dot Guinea is a perfect collaring feather for a grizzly like look on your fly. perfect for sculpin collars and putting on the front of a wooly bugger. guinea does not come in great lengths but does a fantastic job at adding another dimension to any fly. Available in 29 colors.